The Reason for the Crime. An accusation of ritual murder, based on the unexplained assassination of the student Ernst Winter in Konitz, West Prussia. Winter, the son of an architect of Prechlau, attended the gymnasium of Konitz. Although only nineteen years old, he was known for his licentiousness. On March 11, 1900, he left his boarding-house after dinner, and did not return. It was immediately thought probable that the young man had fallen through the ice while skating on the lake. Accordingly the lake was searched, and on March 15 parts of his body were discovered. His right arm was found in the cemetery, where some one had thrown it over the fence; and on April 15 his head was recovered from a pool. The body had been dismembered by some one possessing a knowledge of anatomy; and therefore suspicion first turned against the local butchers, especially against the Christian butcher Hoffmann, whose daughter had been frequently seen in Winter's company, and a member of whose household had been heard to express threats against Winter on account of his attention to the young woman. Anti-Semites, however, tried from the outset to turn suspicion against the Jewish inhabitants, and as there was no evidence implicating any Israelite, they accused the police of intentions to shield the Jews. On May 9, 1900, the "Staatsbürgerzeitung," the leading anti-Semitic organ of Berlin, said: "No one can help forming the impression that the organs of the government received orders to pursue the investigation in a manner calculated to spare the Jews." The opposite was true. Detectives andjudges took up eagerly the most improbable statements implicating Jews, while Christian witnesses withheld important testimony. The wife of the school superintendent Rohde, in whose handkerchief the head of Winter was found wrapped, ignored the appeal of the police asking the owner of this handkerchief to report; and it was by mere accident that the ownership became known. Further, two young men who were last seen in Winter's company never revealed their identity. A Jew, Wolf Israelski, was arrested on the flimsy charge that, two days previous to the discovery of the head, he had been seen walking in the direction of the place where the head was found, with a sack on his back in which there was some round object. Although he denied the fact itself, and although the state of preservation in which the head was found proved conclusively that it must have lain in the ice for some time, Israelski was kept in prison for nearly five months, until his trial (Sept. 8) proved his innocence. The butcher Hoffmann, who also had been arrested, was discharged; and the city council, of which he was a member, gave him a cordial reception when he first appeared after his release. The language of the court in dismissing the case against Hoffmann was, moreover, such that the accusation of ritual murder was indirectly confirmed. Among the grounds for dismissal the court held that the deed must have been perpetrated by several people and according to a premeditated plan. Dr. Müller, the county physician ("Kreisphysikus"), rendered the opinion that Winter had bled to death, which, as subsequent investigations proved, was untenable. This opinion was published in the "Staatsbürgerzeitung," before the investigation of the court had been closed; and for this breach of confidence, Müller's son, who had communicated the document to the press, was censured by a court of honor ("Ehrengericht"). On June 8 of the same year a shed near the synagogue of Konitz was set on fire; and two days later excesses were committed against the synagogue and against Jewish homes to such an extent that the military had to be called out. Similar riots, though not of such a severe character, occurred at Czersk (April 22), Stolp and Bütow (May 21-22), Tuchel (June 10), and Komarczyn (June 17). An old man named Landecker, of Cammin, was without any provocation knocked down with a pitchfork. In all of these cases the sentences imposed upon the rioters or assailants were very light, while Jews, whenever they came before the court, met with hostile sentiment and received heavy sentences for the slightest offenses. A county official to whom a Jew complained of the insults to which he had been subjected on the street, replied: "You can easily obtain relief, if you give up the murderer." A synagogue sexton who defended himself with a stake against a crowd which assailed him was sentenced to spend a year in jail; and a similar sentence was imposed on a Jewish apprentice because he had beaten a boy who had jeered at him. A highly respected citizen, Jacob Jacoby of Tuchel, was sentenced to confinement for one year in the penitentiary for perjury (Oct. 10), because he had sworn that he had called some boys who had shouted "Hep-Hep!" after him "lümmel" (toughs) only after they had insulted him, while the boys swore that he had first called them offensive names. This sentence was indeed so repugnant to public opinion that the emperor commuted it to six months in jail, and revoked that part by which the convict was deprived of civil rights (March, 1901). 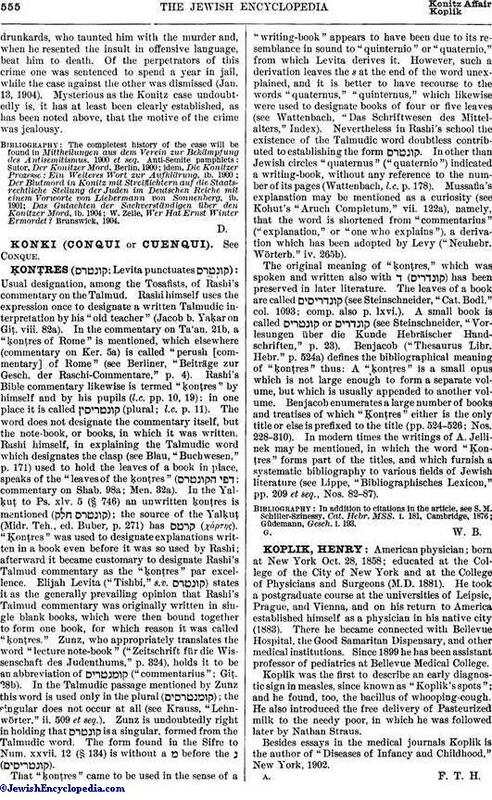 The worst case of persecution was that of Moritz Lewy, referred to below. Very lenient was the attitude of the authorities with regard to two dangerous agitators who tried to make capital out of this affair, the Silesian count Pückler and the Pomeranian pastor Krösell. The former, whom a court afterward adjudged insane, delivered in various cities violent diatribes against the Jews, in which he declared among other things that they must be clubbed out of the country and that the Christians must wade in Jewish blood up to their ankles. Krösell, who later on had to withdraw from the ministry in order to escape a sentence of expulsion on account of his immoral life, delivered in the neighborhood of Konitz lectures on ritual murder and on the immorality of rabbinical literature; but neither the ecclesiastical nor the state authorities would interfere; and the population appreciated Krösell's work to such a degree that in 1903 he was elected to the Reichstag. In the Reichstag, where this case was made the subject of an interpellation (Feb. 8-9, 1901), the Prussian minister of justice Schönstedt limited himself to a defense of the authorities against the charge of shielding the Jews; but he carefully refrained from uttering one word in condemnation of the ritual-murder charge, and even from stating that there was no reason for assuming such a motive in the case of Ernst Winter. The anti-Semites naturally were unscrupulous in their desire to make capital of this opportunity. Liebermann von Sonnenberg, their political leader, said in a public address: "The Christians have not yet become accustomed to bear without a murmur the killing of Christian youths in an unnatural fashion by Jews within the city walls." The anti-Semitic papers, including the organs of the Clerical party like "Germania," and those of the Conservatives like the "Kreuzzeitung," constantly stirred up religious fanaticism and fostered the prejudice that the government had been bought by the Jews. A society for the investigation of the murder was formed in Konitz. The statement was spread that the coroner's commission had not searched the ritual bath near the synagogue, and had left undisturbed a room in the house of the butcher Adolf Lewy in which his wife was supposed to be sick. This statement was untrue; not only had all the rooms in Lewy's house and every nook and corner in the synagogue been searched, but the commission had even taken a sample of the blood of chickens from the yard which was used for killing fowl (see Sheḥiṭah), thus adding to the suspicions of the populace. The police were evidently mistaken as to traces of the deed, for some of the garments of the murdered youth were kept in a house in the city untilJan., 1901, without being discovered by them, and were subsequently found on different days in a public park. The members of a highly respectable family named Rosenthal in Cammin were kept in prison for six months, because a servant-girl of bad character testified that she had heard Rosenthal say that he would hang himself on a hook in the ceiling of his room, as he was unable to bear the remorse he felt for having participated in the murder of Winter. Investigation proved that this was intentionally false testimony. In the room, where, according to the girl's statement, Rosenthal had pointed to the hook, there never had been such a hook; but the case against the girl was dismissed on the plea of insanity (1902). The fact that the manner in which Winter's body had been dismembered showed a skilful hand led from the start, as stated above, to a suspicion against butchers, and Adolf Lewy, whose house was near the lake where the trunk of Winter's body was found, was one of the suspects. From the state of the contents of Winter's stomach it was proved, however, that Winter could not have died later than seven o'clock in the evening. Fortunately Adolf Lewy and his son Moritz could prove an irrefutable alibi for the hours during which the murder had been committed; but the anti-Semites, who desired their implication, testified that Moritz Lewy had been frequently seen in Winter's company. Lewy denied having been acquainted with Winter, although he admitted that he might have spoken to him, and even have walked with him a certain distance, as witnesses had testified, without knowing him by name. At the trial for perjury of the normal-school student Speisiger, who had made various statements implicating Jews, Lewy renewed his statement that he had not known Winter, while various witnesses testified that they had seen them together. Lewy was arrested Oct. 6, 1900. The charges against the Lewys rested on the testimony of a disreputable person, named Masloff, and his mother-in-law, named Ross. 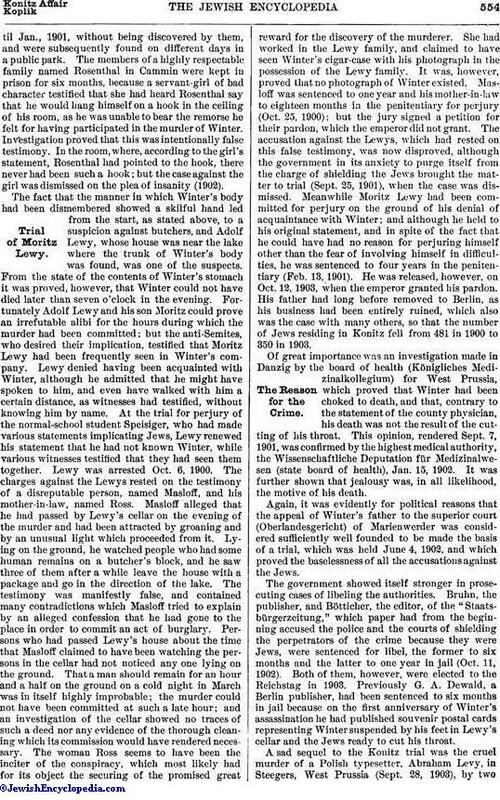 Masloff alleged that he had passed by Lewy's cellar on the evening of the murder and had been attracted by groaning and by an unusual light which proceeded from it. Lying on the ground, he watched people who had some human remains on a butcher's block, and he saw three of them after a while leave the house with a package and go in the direction of the lake. The testimony was manifestly false, and contained many contradictions which Masloff tried to explain by an alleged confession that he had gone to the place in order to commit an act of burglary. Persons who had passed Lewy's house about the time that Masloff claimed to have been watching the persons in the cellar had not noticed any one lying on the ground. That a man should remain for an hour and a half on the ground on a cold night in March was in itself highly improbable; the murder could not have been committed at such a late hour; and an investigation of the cellar showed no traces of such a deed nor any evidence of the thorough cleaning which its commission would have rendered necessary. The woman Ross seems to have been the inciter of the conspiracy, which most likely had for its object the securing of the promised great reward for the discovery of the murderer. She had worked in the Lewy family, and claimed to have seen Winter's cigar-case with his photograph in the possession of the Lewy family. It was, however, proved that no photograph of Winter existed. Masloff was sentenced to one year and his mother-in-law to eighteen months in the penitentiary for perjury (Oct. 25, 1900); but the jury signed a petition for their pardon, which the emperor did not grant. The accusation against the Lewys, which had rested on this false testimony, was now disproved, although the government in its anxiety to purge itself from the charge of shielding the Jews brought the matter to trial (Sept. 25, 1901), when the case was dismissed. Meanwhile Moritz Lewy had been committed for perjury on the ground of his denial of acquaintance with Winter; and although he held to his original statement, and in spite of the fact that he could have had no reason for perjuring himself other than the fear of involving himself in difficulties, he was sentenced to four years in the penitentiary (Feb. 13, 1901). He was released, however, on Oct. 12, 1903, when the emperor granted his pardon. His father had long before removed to Berlin, as his business had been entirely ruined, which also was the case with many others, so that the number of Jews residing in Konitz fell from 481 in 1900 to 350 in 1903. Of great importance was an investigation made in Danzig by the board of health (Königliches Medizinalkollegium) for West Prussia, which proved that Winter had been choked to death, and that, contrary to the statement of the county physician, his death was not the result of the cutting of his throat. This opinion, rendered Sept. 7, 1901, was confirmed by the highest medical authority, the Wissenschaftliche Deputation für Medizinalwesen (state board of health), Jan. 15, 1902. It was further shown that jealousy was, in all likelihood, the motive of his death. 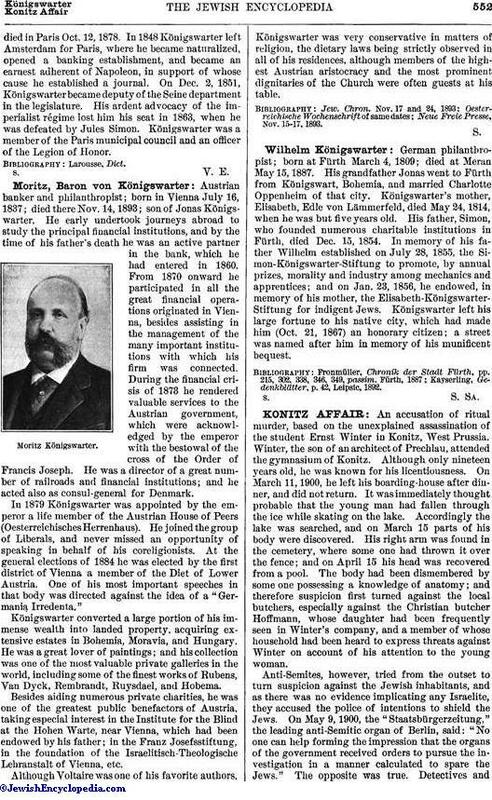 Again, it was evidently for political reasons that the appeal of Winter's father to the superior court (Oberlandesgericht) of Marienwerder was considered sufficiently well founded to be made the basis of a trial, which was held June 4, 1902, and which proved the baselessness of all the accusations against the Jews. The government showed itself stronger in prosecuting cases of libeling the authorities. 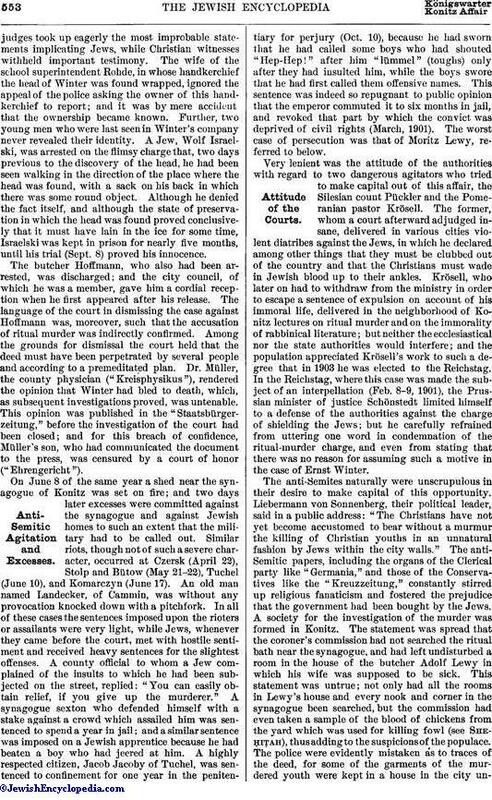 Bruhn, the publisher, and Bötticher, the editor, of the "Staatsbürgerzeitung," which paper had from the beginning accused the police and the courts of shielding the perpetrators of the crime because they were Jews, were sentenced for libel, the former to six months and the latter to one year in jail (Oct. 11, 1902). Both of them, however, were elected to the Reichstag in 1903. Previously G. A. Dewald, a Berlin publisher, had been sentenced to six months in jail because on the first anniversary of Winter's assassination he had published souvenir postal cards representing Winter suspended by his feet in Lewy's cellar and the Jews ready to cut his throat. A sad sequel to the Konitz trial was the cruel murder of a Polish typesetter, Abraham Levy, in Steegers, West Prussia (Sept. 28, 1903), by twodrunkards, who taunted him with the murder and, when he resented the insult in offensive language, beat him to death. Of the perpetrators of this crime one was sentenced to spend a year in jail, while the case against the other was dismissed (Jan. 13, 1904). Mysterious as the Konitz case undoubtedly is, it has at least been clearly established, as has been noted above, that the motive of the crime was jealousy. The completest history of the case will be found in Mittheilungen aus dem Verein zur Bekämpfung des Antisemitismus, 1900 et seq. W. Zelle, Wer Hat Ernst Winter Ermordet? Brunswick, 1904.